From Cabinets To Go, today’s review focuses on the Malibu White Shaker. With locations all over the states, we are lucky enough to have one within driving distance of our workshop here at RTA Cabinet Reviews. We placed the order for the Malibu and were able to go pick up the unit as soon as it arrived at the closest store location. The website itself is fairly difficult to navigate, and there is no description of the specs for the different cabinet varieties Cabinets To Go carries. When shopping for a white shaker unit, we discovered the B18 from Cabinets To Go is $20 less expensive than a B15. While we could not see the rationale behind this pricing for a larger product, we went ahead and assembled the B18. The same grading criteria will apply to the B18 as has applied to the B15 units we have reviewed. 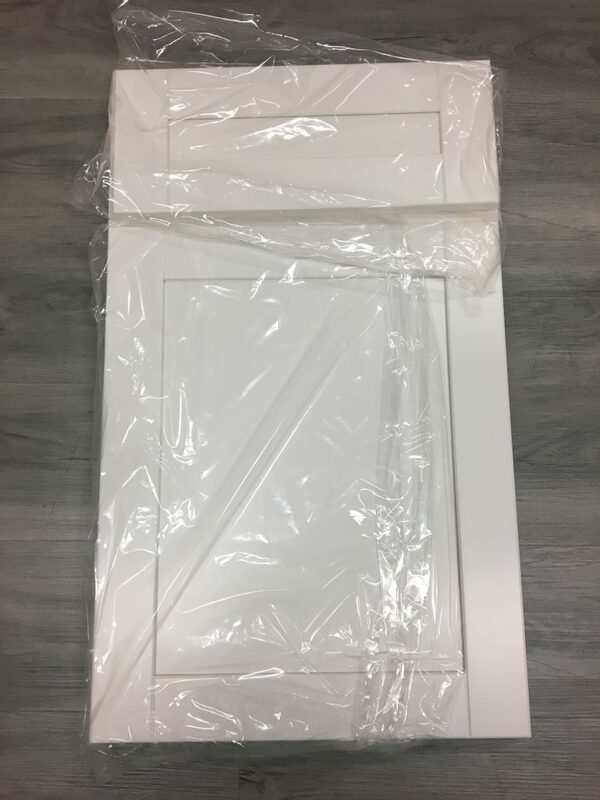 Pre-assembled to the cabinet frame, the door of the Malibu White Shaker arrives with a thin plastic wrapping preventing it from rubbing against the frame during the shipping process (Picture 1). 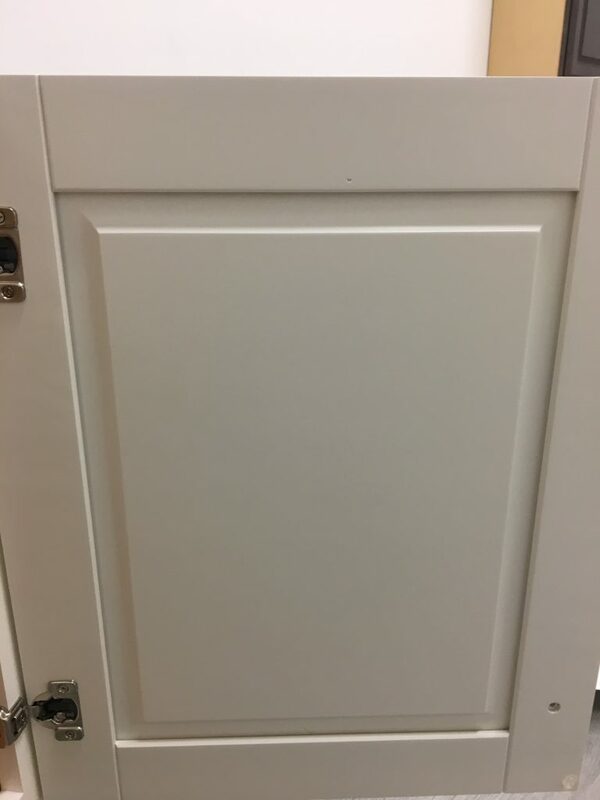 Medium or high-density fibreboard (a wood fiber substitute for natural hardwoods) composes this 5 piece shaker style door, with the center panel having a bevel on the inside to give the option for a slightly varied look to the traditional simple look on the cabinets face (Picture 2). Vertical grooves are seen routed between the rails and stiles, clean cut and consistent on both the door and the drawer face. We have seen this with several units (Shaker Hill, Traditional White Shaker, Simply White), and while it is not a feature we typically see it is still a simple, classic look. 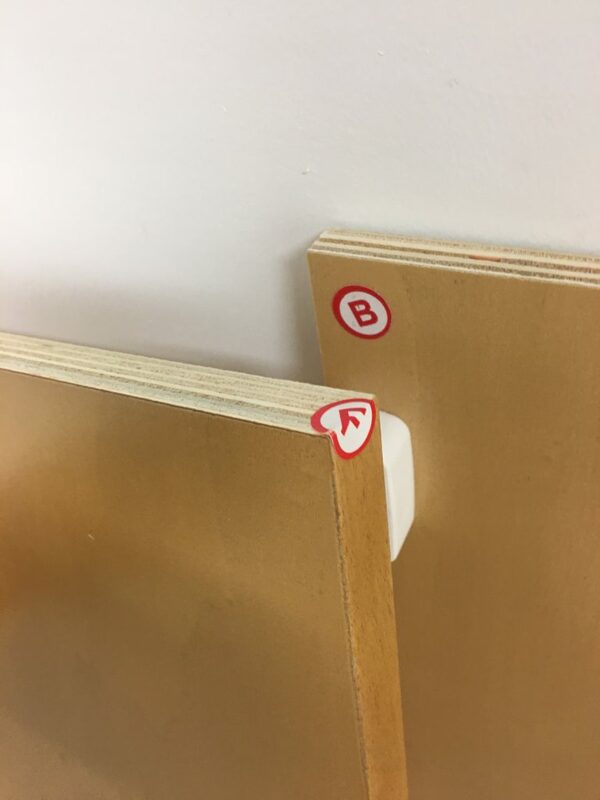 absorb paint on the end cuts because of the porous nature of exposed (cut) natural wood. 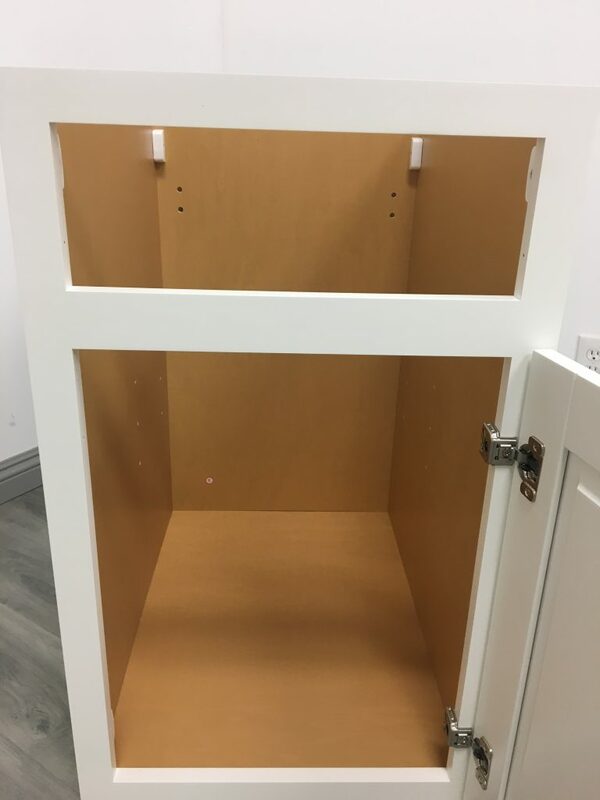 The manufacturer of this unit, Findley and Myers, have received mixed reviews concerning the quality of the materials used in their units, but the paint and finish found on the face of this particular unit have left us satisfied. 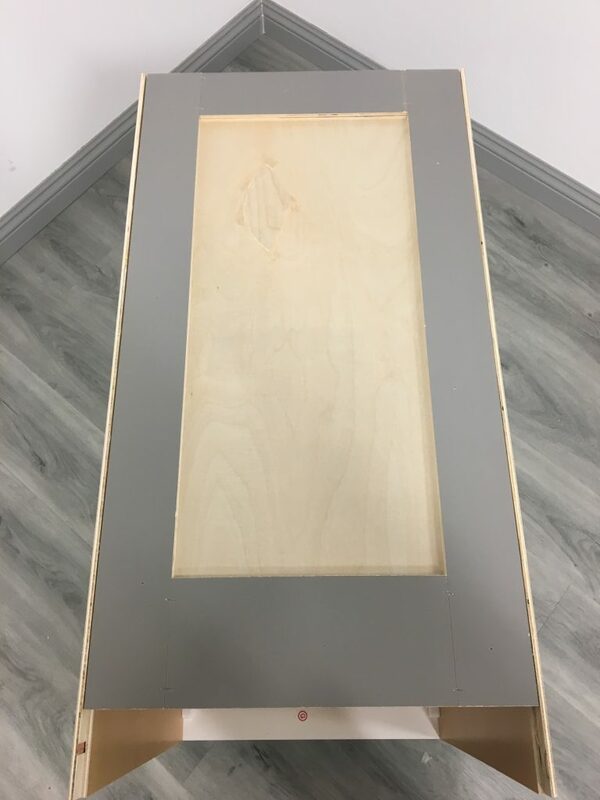 Paying close attention to the interior finish of the units we review is essential when estimating the quality and lifespan a cabinet offers. With a quality interior finish, the durability will withstand daily scuffing from items being dragged across the surface and set upon it for years. The stain of the finish on the Malibu White’s interior is unique in its caramel coloring. This gives a vintage aesthetic to the interior of the cabinet that is charming as well as clean. The natural wood grain is still visible on all the panels, contrasting with the bright white of the exterior paint for a unique overall look that is agreeable (Picture 5). We pay close attention to the quality of the plywood of the cabinet box, as this will dictate the stability of the unit and give us a clear idea of exactly what can be expected from the Malibu’s performance. 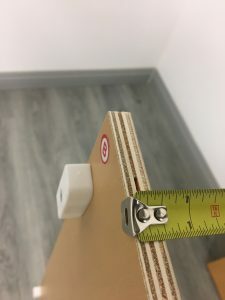 The side panels show a medium grade quality plywood measuring 1/2 inch in width, slightly above the industry minimum standard of 3/8 inches (Picture 6). With no visible warping, the panels fit together nicely and keep the integrity of the unit uniform. Additionally, the side panels are also labeled with lettered stickers corresponding to the instructions, making for an extremely straightforward assembly process. Unique to the Malibu White Shaker is the picture-frame recess back panel. The cuts for the rails and stiles are clean, the plywood used is pressed neatly, and the panel itself resonates an overall impressive quality. Measuring 3/4 inches thick, the back panel is among the top grade picture-frame recess panels we have come across in our reviews (Picture 7). Perhaps the most defining feature of the panel is the grey-painted frame surrounding the center panel (Picture 8). 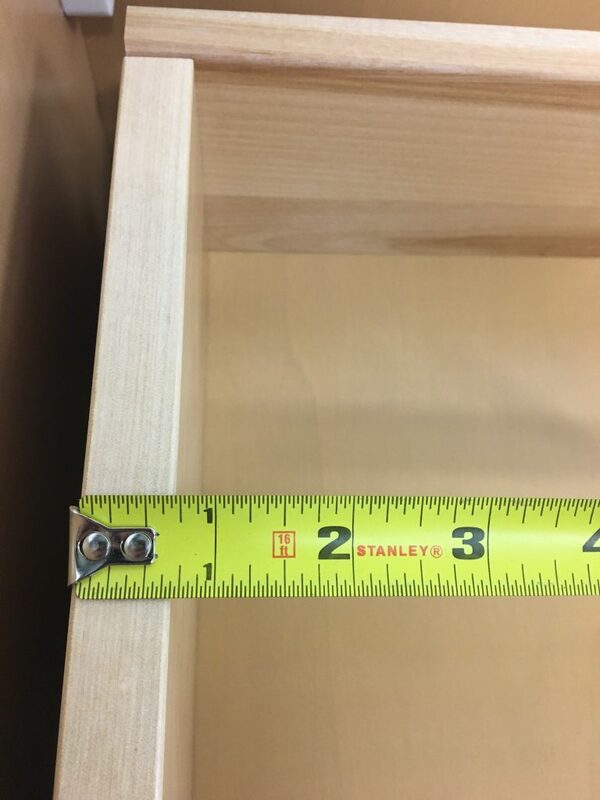 While this may not be visible once the cabinet is installed, it is still worth noting the effort and time taken to giving this minor detail that looks sharp overall. 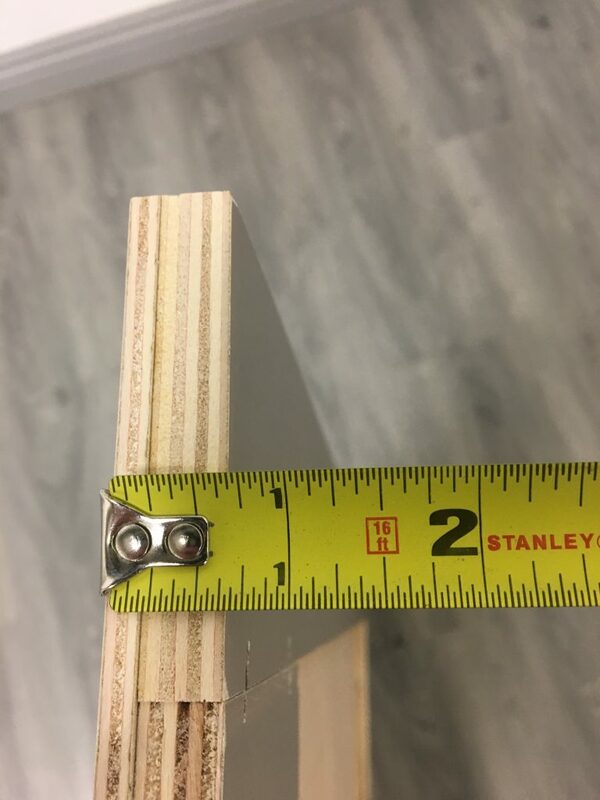 Thinner than the other composing panels is the bottom panel, measuring 3/8 inches thick but of quality plywood (Picture 9). The topside of this panel is covered with the same caramel finish as the side and back panels. 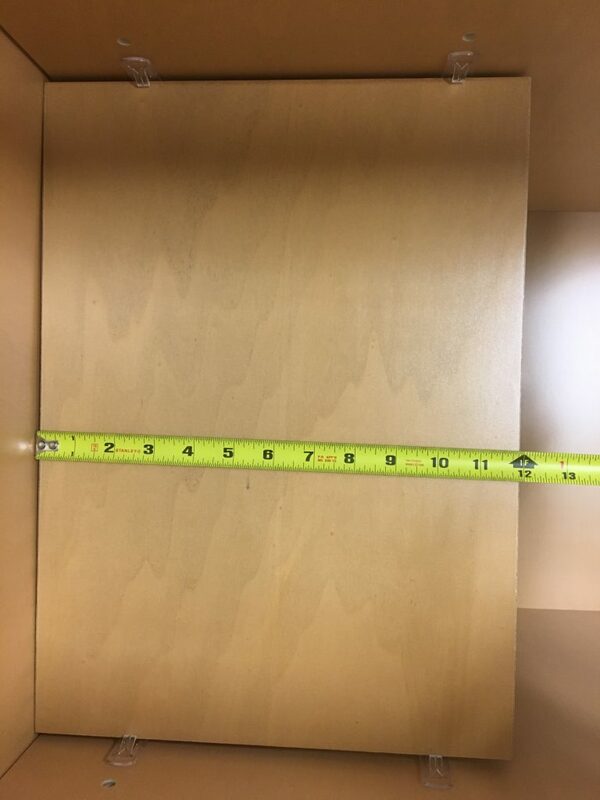 Although the bottom panel may be only 3/8 inches, it is still made of such quality plywood as to give us no reason to believe it is incapable of supporting the weight of a cabinet box filled with heavy items. It fits nicely between the side panels by means of tongue-in-groove cuts, with the back panels locking and securing the bottom in place through the cam lock devices along the side panels. 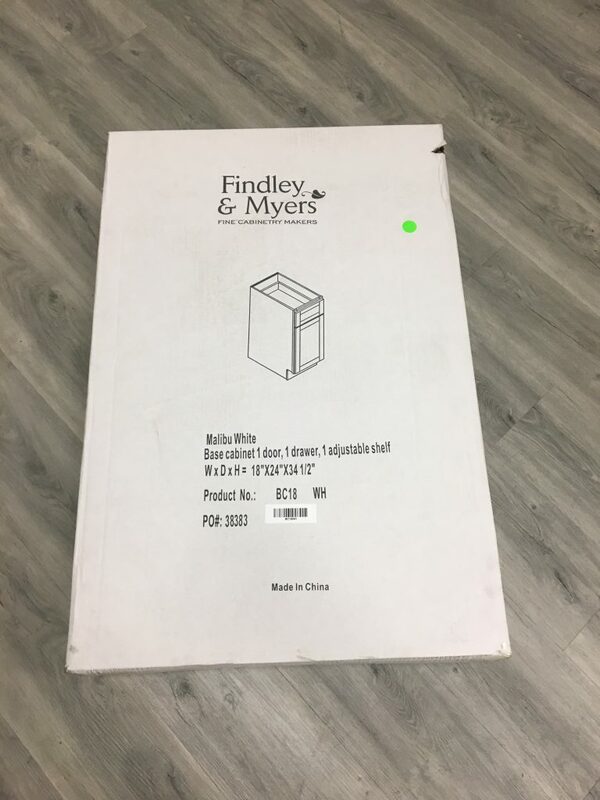 Findley and Myers provide a solid, impressive drawer box with the Malibu White Shaker. 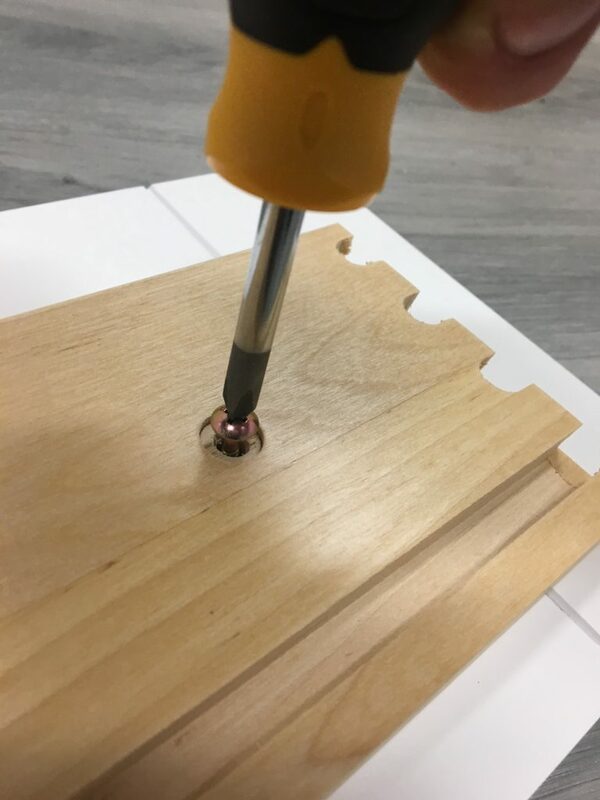 The front panel of the drawer box needs to be attached to the drawer face with wood screws, but this process is made very easy because the pilot holes found on both pieces line up without issue (PIcture 10). This is pretty rare for an RTA cabinet, as most come with the front panel of the box pre-attached to the drawer face. 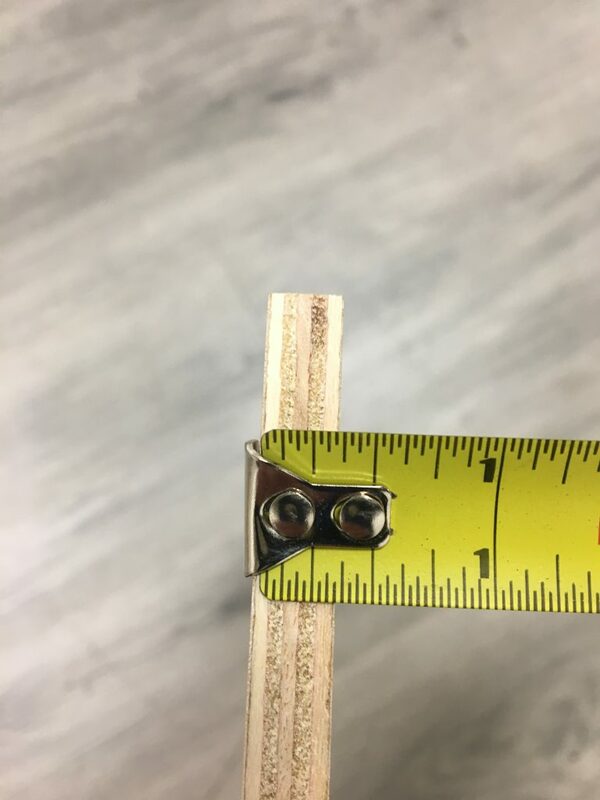 While it does not take much time, this task still opens up room for error and possible damage when performing; still, it is nothing that seriously disparages the quality of the drawer box. 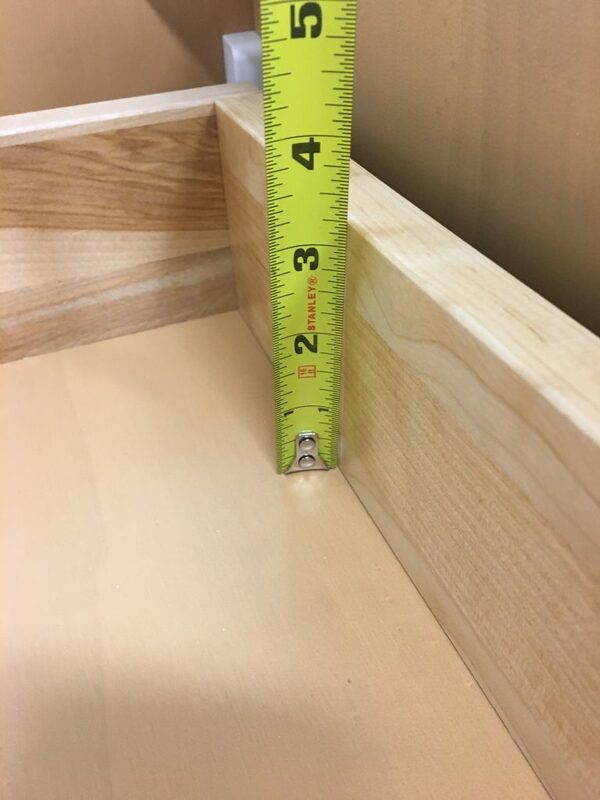 Like the bottom panel of the cabinet box, the bottom panel of the drawer box measure 3/8 inches thick–industry standard and capable of supporting the weight of a full drawer (Picture 11). The plywood is pressed tightly and cut clean along all four edges, making it slide smoothly into place between the side panels. 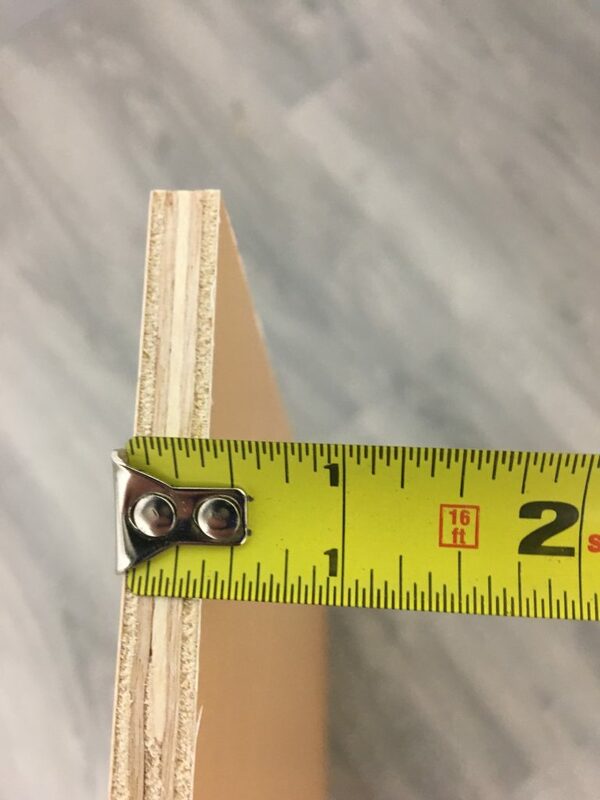 These side panels, measuring 3/4 inches thick, are finished with flat-top molding along the top edges and fit nicely together at the corner joints (Picture 12). The dovetailing is slightly loose once the teeth are snapped together in place, but hold fast and cannot be separated unless intense force is exerted. 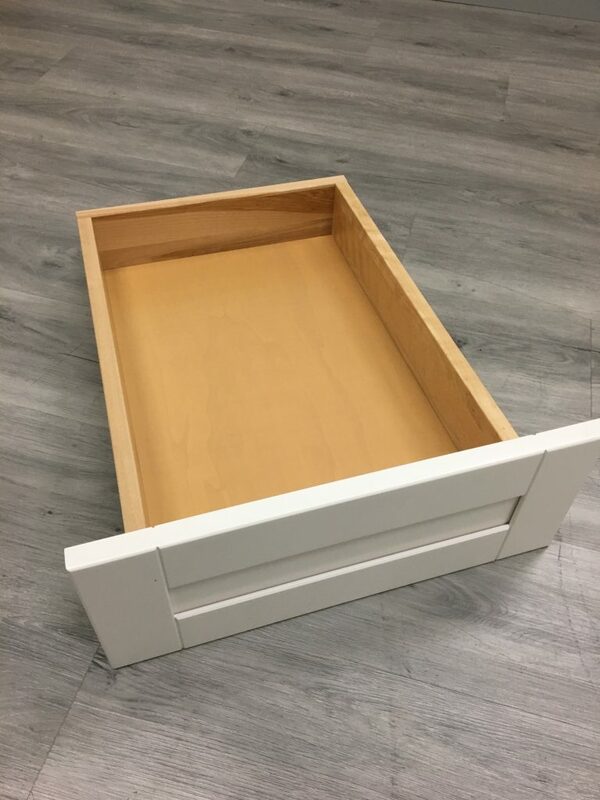 A rubber mallet is used to gently tap the panels into place, and the end result is a strong, deep, clean looking drawer box (Picture 13). With thick side panel, smooth dovetail cuts, and an overall sturdy build, the drawer box of the Malibu White is among the top of the contenders for the highest quality we have yet reviewed. Storage is a direct illustration of the practical functionality of a shaker unit. The drawer box of the Malibu White Shaker is very impressive; with a depth of 3 and 1/4 inches (Picture 14), it is capable of storing more items than the industry standard drawer boxes maxing out at a depth of just around 3 inches. 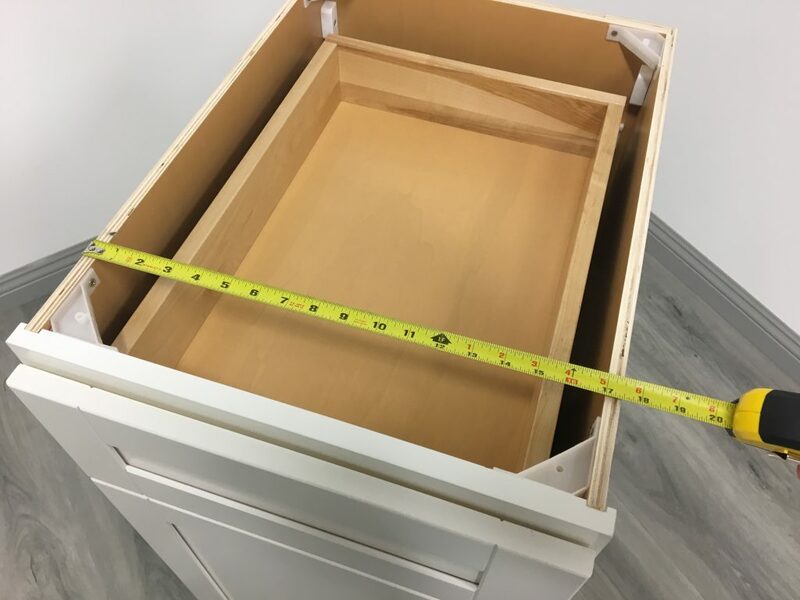 This deeper drawer box allows for more items to be stored, with the full extension capability enabling a dearth of ladles, spatulas, knives, and many other utensils to be stored without getting caught on the frame of the cabinet. unit, creating negative space that cannot be properly utilized for anything. 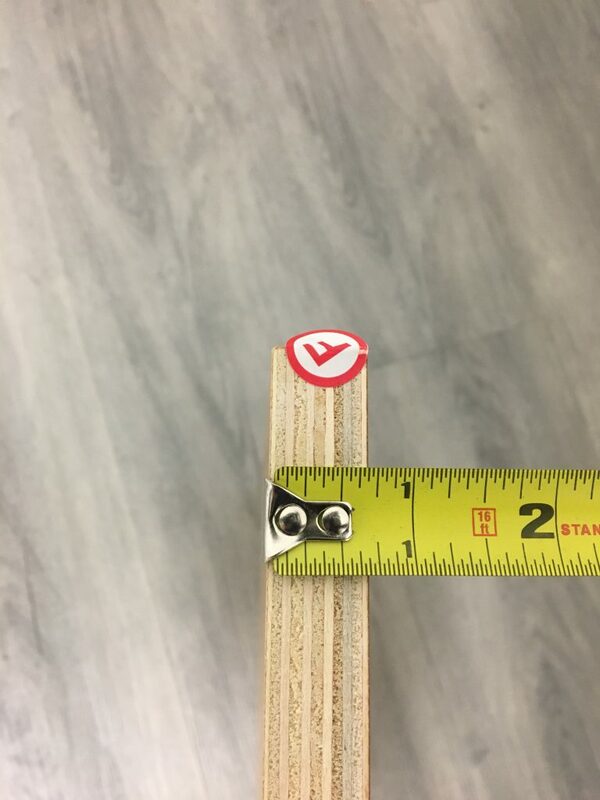 This cost-cutting measure sells the customer short of the practical functionality of a cabinet. 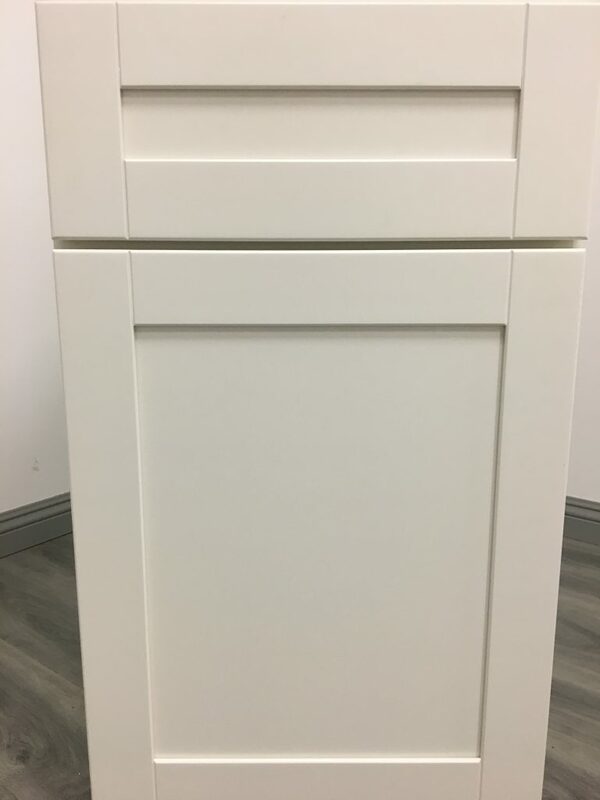 With DTC hinges, the Malibu White Shaker touts quality soft close mechanisms that protect the frame of the cabinet from the door slamming into it whenever the door is shut. 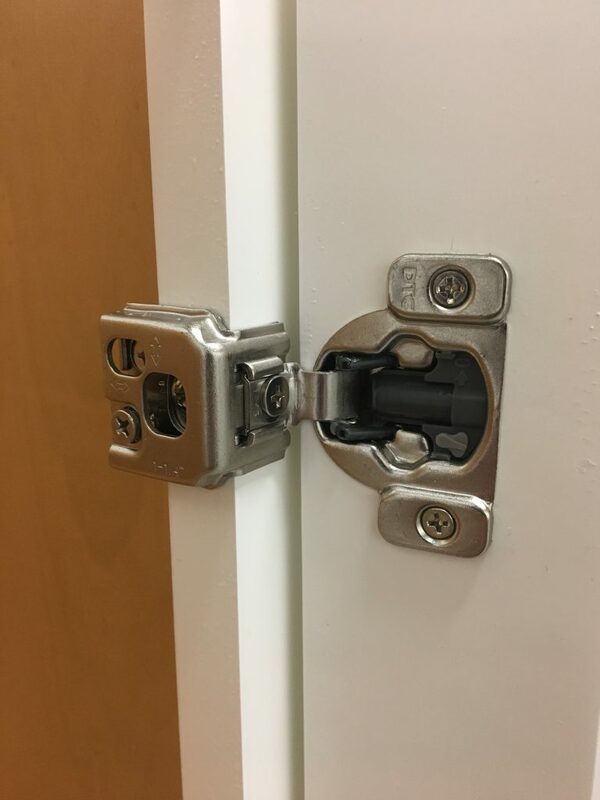 DTC manufacture dependable, stainless steel hinges with plastic pumps that ease the door closed with appropriate resistance. 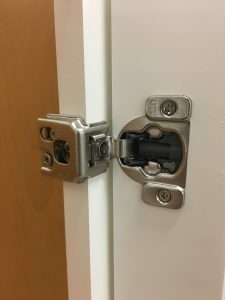 BLUM hinges set the bar high as being the top of the line hardware for RTA cabinets, but DTC is directly beneath BLUM with hinges that are affordable, effective, and dependable (Picture 17). 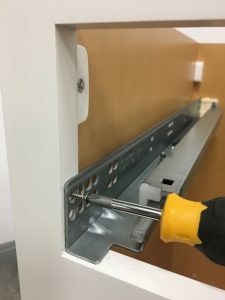 Drawer Slides serve more of a purpose than simply providing a track for the drawer box to slide in and out of a cabinet unit. These DTC manufactured slides are attached to the frame by means of pilot holes on either side of the drawer box alley (Picture 18). 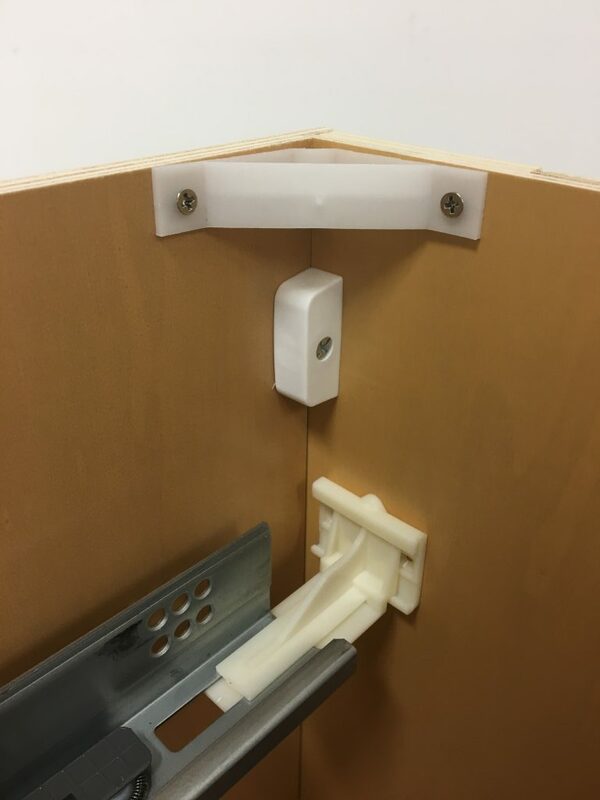 At the back of the cabinet box, the glides are supported by beige plastic anchors which fix to the back panel. By creating a bridge between the front of the cabinet and the back panel the integrity of the cabinet is reinforced, thus stabilizing the unit even further. When we inspect connecting hardware of a unit, we look closely at the material implemented to join the box together. From plastic corner blacks at the joints to the aforementioned beige plastic drawer glide anchors, the Malibu White Shaker meets minimum industry standards concerning the quality of these pieces (Picture 19). 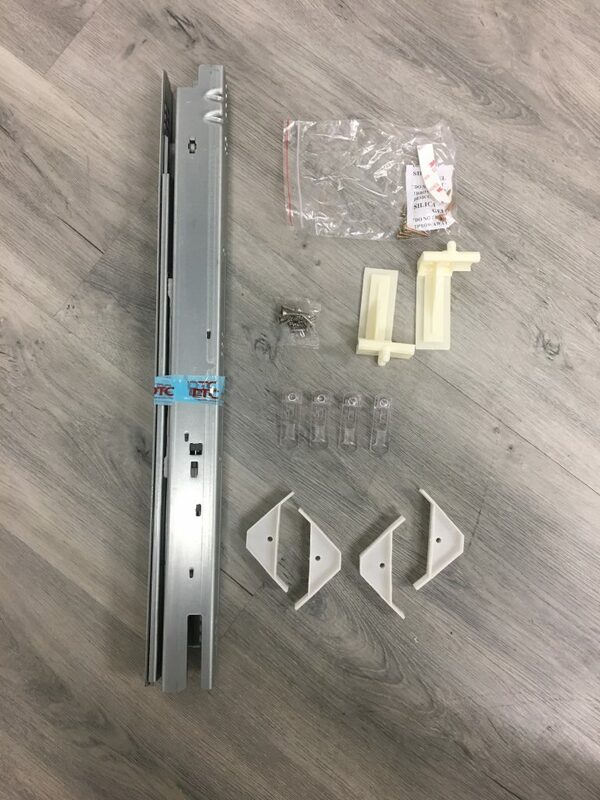 The nature of these plastic parts (including the plastic shelf pegs) causes us to seriously doubt the durability of them, with the need to replace each one being an inevitability as natural wear and tear breaks down the parts. An impressive element of the Malibu is the cam locks attaching the side panels to the front and back panels (Picture 20). The white plastic housing is thick, with the locking mechanisms biting strong; the only exception is the Phillips female end on the cam lock is easily stripped when turned too far. The exterior packaging is the first impression we receive of the unit when it arrives. From the double corrugated cardboard surrounding the contents of the parcel to the manner by which the interior pieces are wrapped, the Malibu has a package-job that has left us veritably impressed (Picture 21). 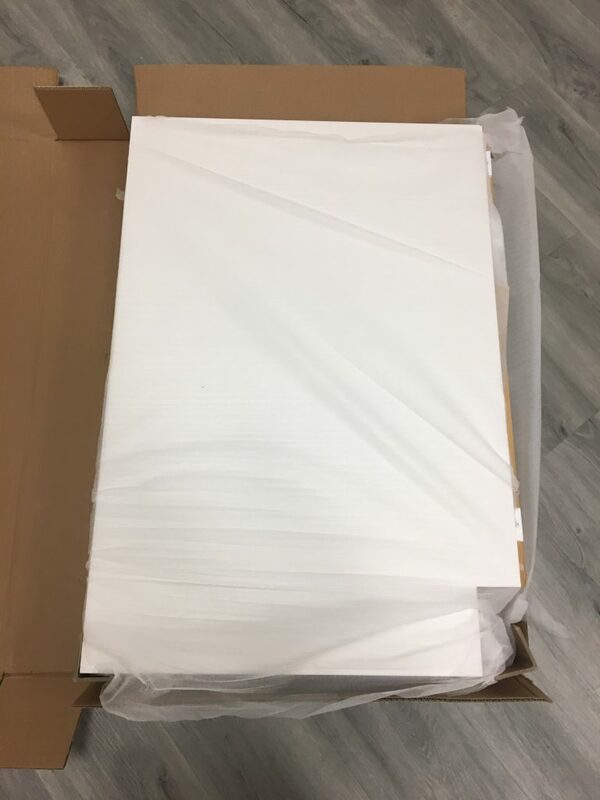 Thin styrofoam sheets are wrapped around each piece and through the interior arrangement, with styrofoam cuts providing an added level of protection during transit (Picture 22). This organization within the package makes the assembly process straightforward, quick, and overall less stressful than a messy pack-job. Closer inspection of the interior of the package reveals even more impressive features, with the minor details exhibiting the extent to which the manufacturer is willing to go to ensure the safety of the unit. 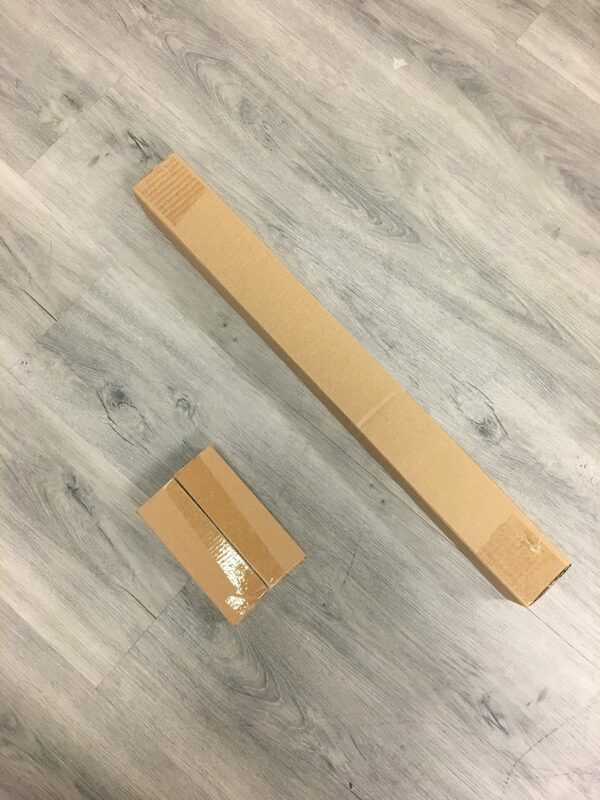 Hard cardboard corner pieces keep the package from being damaged as it makes its way to the final installation location (Picture 23). 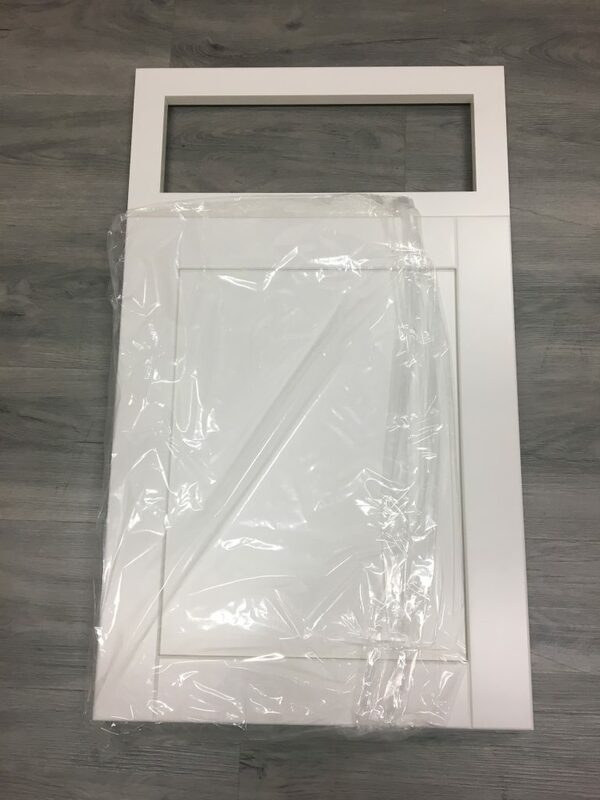 Additionally, the cabinet frame, door, and drawer face are tightly wrapped in thick plastic with a styrofoam sheet separating the door and frame to keep the two from scratching the other (Picture 24). 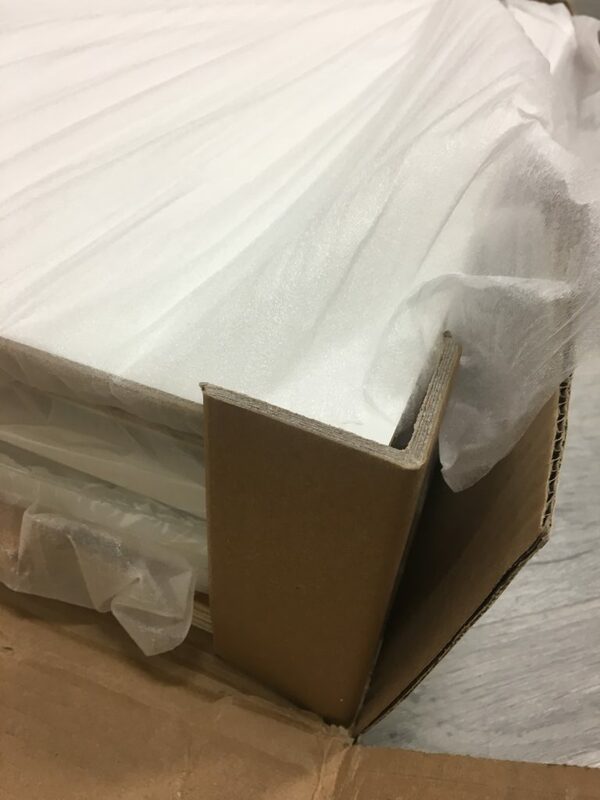 With the connecting hardware separated in its own cardboard boxes, the organization of this package is what truly impresses us most, it assists not only in the assembly process but also adds to the protection of each individual piece (Picture 25). The most unique feature concerning the assembly process of the Malibu White Shaker is the fact that each panel and connecting part is labeled with a small sticker bearing a letter that corresponds to the picture guided instructions (Picture 26). 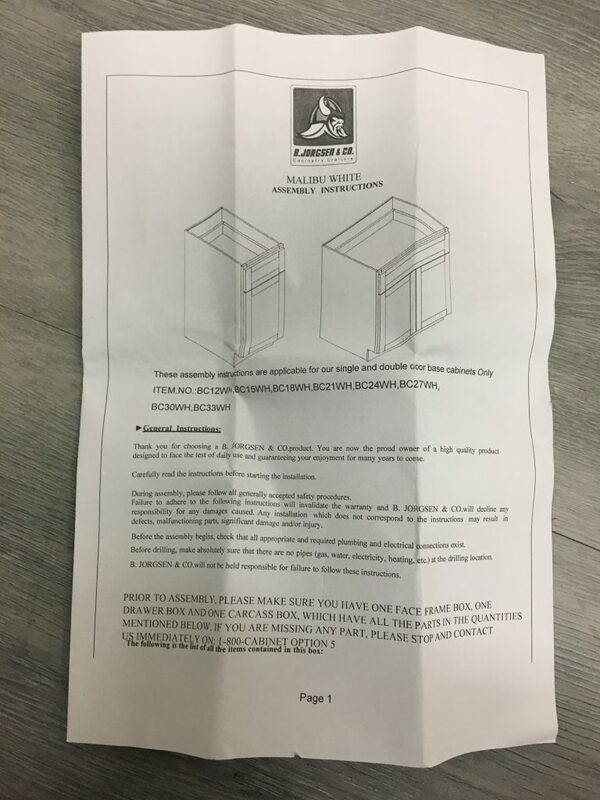 The instructions, bearing the logo of “L. Jorgsen & Co.” are very lucid and detailed (Picture 27). Written in English and bearing a number of detailed pictures, the instructions combined with the cam lock assembly make this process one of the easier jobs we have encountered with an RTA cabinet (Picture 28). 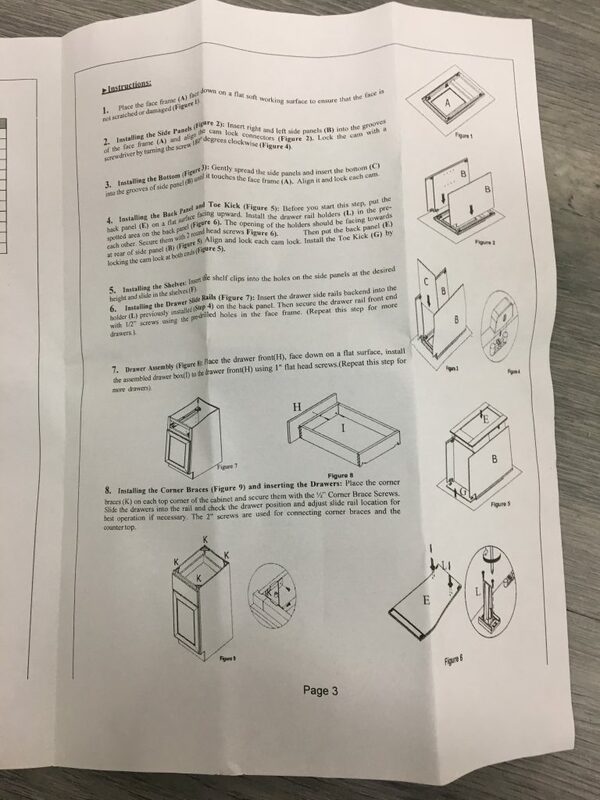 Combined with good instructions, minimal tool requirements, and the need for only one person to put the unit together, the Malibu White Shaker should pose no real issues when assembling the cabinet. 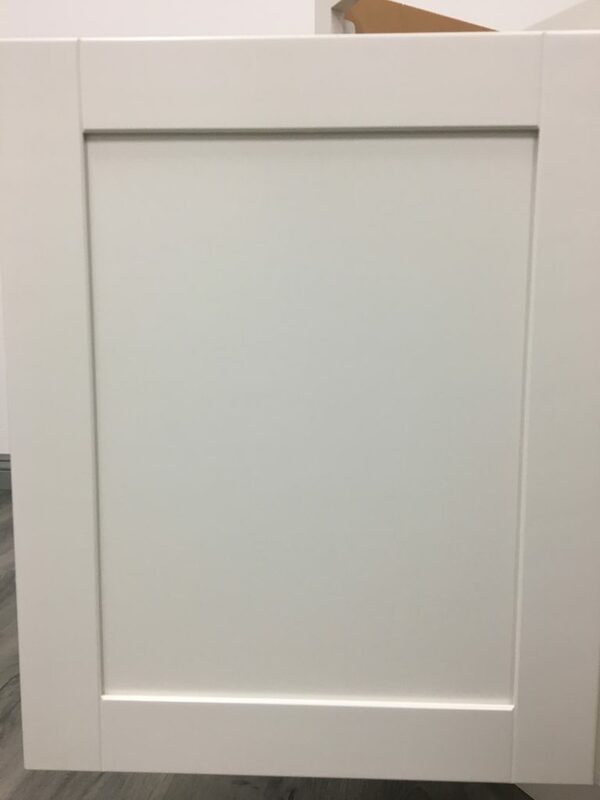 A gorgeous door finish that this thick, evenly applied, displaying no visible cracks, and consistent on the front and backside of the door. An aesthetically appealing caramel colored interior finish that is unique in look as well as high-grade quality. Top quality packaging, with double-corrugated cardboard, styrofoam sheets and cuts separating pieces, and cabinet face wrapped separately. Quick assembly due to the impressive cam locks, complete with hard plastic housing. MDF or HDF material used to compose the door rather than authentic wood such as birch or beech. Plastic corner pieces joining the panels in the corners and plastic anchors supporting the drawer slides, neither of which we expect to endure the test of time. A website on CabinetsToGo that is difficult to navigate and does not provide the online support we have received from other distributors. As far as the overall quality of the Malibu White Shaker, we have to give this unit the kudos it deserves. 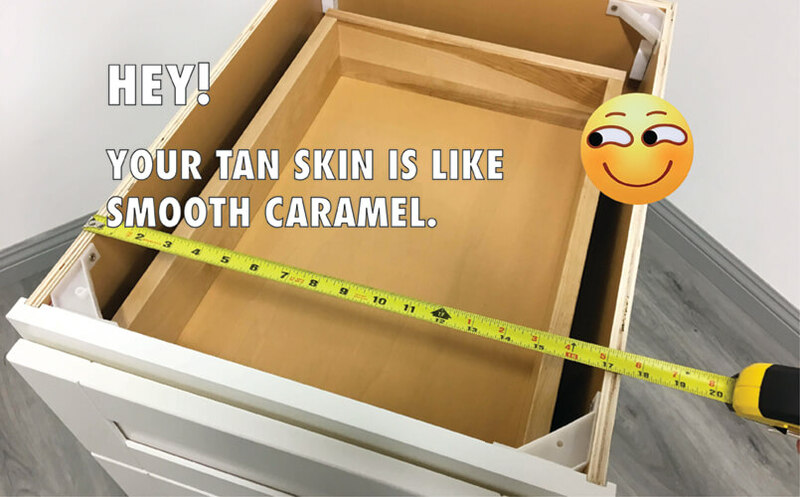 While the majority of the hardware is industry standard, the cabinet boasts a quality paint and finish, a high-end drawer box, straightforward and quick assembly, and packaging illustrating the care for the product Findley and Myers holds. We stand behind awarding the Malibu White Shaker one of the higher grades of any cabinet we have reviewed. Crisp white paint coat & full back panel but no instructions with the Ice White Shaker from BOC!